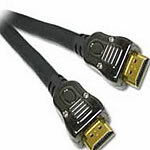 Split 1 HDMI output for display on 2 HDMI compatible monitors. 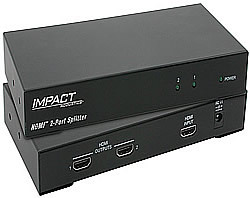 The 2-Port HDMI Splitter with HDCP compatibility by Impact Acoustics™ will connect an HDMI equipped source to two HDTV displays equipped with HDMI inputs. HDCP compatibility means this splitter will work with high definition video from sources including DirecTV®, Dish Network®, cable television, and HD-DVD players. Impact Acoustics splitters are designed to support 480i, 480P, 720P, 1080i and 1080P resolutions. Cascadable up to 3 layers, one output may be used to feed up to 8 displays from one source. Equalizer circuitry enables this device to transmit an HDMI signal to distances of up to 80ft between source and display. 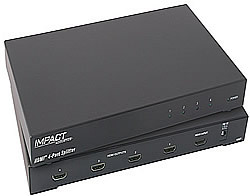 The 4-Port HDMI Splitter with HDCP compatibility by Impact Acoustics™ will connect an HDMI equipped source to up to four HDTV displays equipped with HDMI inputs. HDCP compatibility means this splitter will work with high definition video from sources including DirecTV®, Dish Network®, cable television, and HD-DVD players. Impact Acoustics splitters are designed to support 480i, 480P, 720P, 1080i and 1080P resolutions. Cascadable up to 3 layers, one output may be used to feed up to 64 displays from one source. Equalizer circuitry enables this device to transmit an HDMI signal to distances of up to 80ft between source and display.